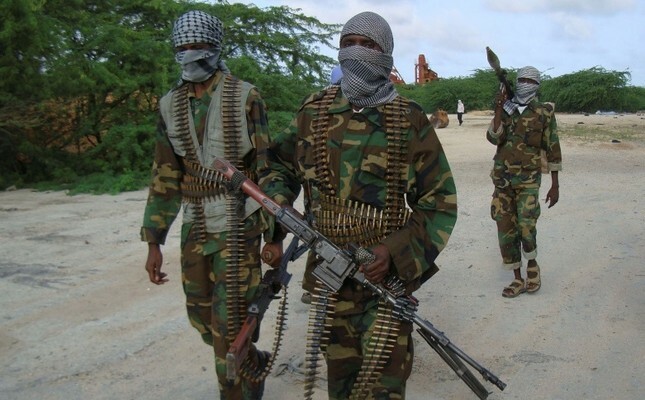 At least 15 people, including 10 al-Shabaab militants and five Somali soldiers, were killed on Monday after the terrorist group stormed a military base in the south of the country, a military official said. "The attack began when a suicide bomber drove an explosives-laden car into the entrance of the base, and then it was followed by heavily armed militants from different directions," said Mukhtar Aden Mohamed, a senior military official in the region. "Following an hourslong assault by militants, our troops were able to repel them out of the area," he said, adding that 10 militants and five soldiers were killed in the battle near the port city of Kismayo in the Lower Juba region. Residents of the town of Jamame, 70 kilometers (44 miles) away from Kismayu, said they heard the blast, followed by gunfire. "We heard a huge blast after early morning prayers. Then heavy exchange of gunfire followed. It was in the direction of Baar Sanguni," Osman Abdullahi told Reuters. Al-Shabaab claimed a much higher death toll, however, announcing on its Radio Andalus that they had killed 27 soldiers at the base. "We first attacked the base with a suicide car bomb and then stormed," said Abdiasis Abu Musab, al Shabaab's spokesman for military operations. "We killed 27 soldiers and took the base. Some soldiers fled into the jungles." The base is staffed by regional forces and some Somali elite forces trained and funded by the U.S. government. Al-Shabab militants have been fighting Somalia's internationally-recognized government for control of the country since the group was ousted from Mogadishu in 2011 by African Union-led forces. Despite being forced out of Mogadishu and many other cities and towns across Somalia, the group still holds sway in large parts of the countryside and launch regular gun and bomb attacks on government, military and civilian targets in Mogadishu and ambushes on military convoys and outposts. Al-Shabab has also attacked neighboring countries that have sent troops to support the Mogadishu government. On Jan. 15, 2016, the militants killed over 100 Kenyan soldiers during the El-Adde military base attack. In April 2015, the militants carried out their bloodiest attack on Kenya's Garrisa University where they killed at least 148 students.